This Venue is Closed ! Check new clubs in Las Vegas: XS, Vanity, Marquee, TAO. Element will be a Night Club like no other in Vegas. 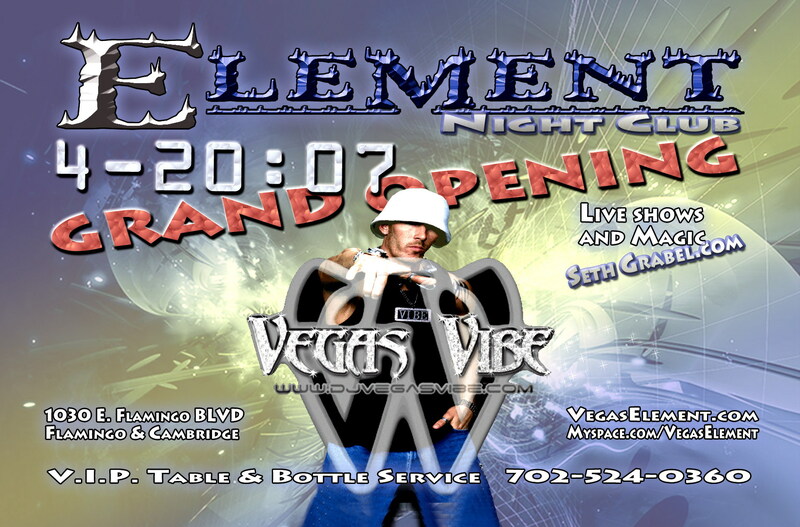 Element Nightclub is a 13,000 sq ft free standing Classy Night Club 1 mile away from the strip. Element has an outside garden deck area and a view of the strip with 2.5 acres of parking and valet, there are no parking garage hassles. This makes for great outdoor events as well. Everyone is welcome and encouraged to come and enjoy the festivities inside the club. Bottle service is available with private cabana rooms and customized luxury lounge areas. Element also features the Xhale Lounge, which is a private VIP room with a unique floor seating concept, for private parties and special bookings. What sets Element apart? Aside from the location, the parking, the building, and the view! Aside from the nightly themes 7 days a week catering to every crowd! Element still has so much more to offer to set itself apart from the rest. Imagine, going to a night club you've heard so many good things about. You are excited to see what it has to offer. Then you walk into an exotic environment of sights and sounds, people and music. You grab your bearings and decide, as your listening to the newest music mixes from various DJ's, that its time for a drink. As you approach the bar you see one of our specially trained bottle service waitresses pouring a bottle into a levitating glass. "Wow, I've never seen that in a club before." Still on your way to the bar you get closer and realize, "ok cool they have flare bartenders..." but with a twist all of a sudden they end their flashy show with a floating fire trick. "Hey guys, this place is amazing" This is just a taste of the things Element offers that sets it apart from the rest. Element... A magic themed Night Club, means you will get to see magic while you are their. From magicians that do table tricks to waitresses with a slight of hand, to bartenders who are even quicker than you though possible with magic and flare combined. All of this in combination to shows on stage, and the variety of themes every night of the week. Element is now the part of history of Vegas nightlife scene, 1 OAK, Hyde, Surrender and others took over the new era.